1. 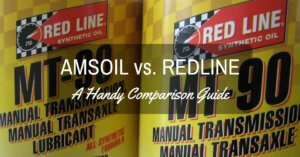 The continued use of poor quality motor oils will cause the build-up of engine sludge. 2. Extended oil change intervals or not changing the oil and oil filter periodically will accelerate the formation of engine sludge. 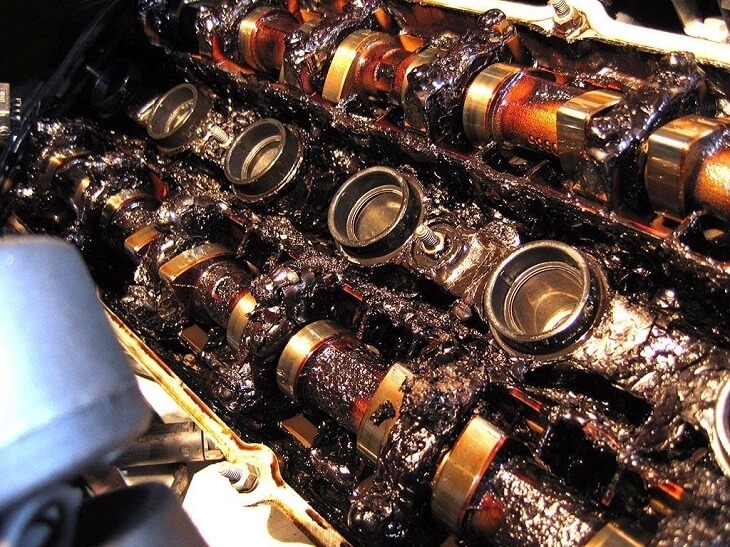 Engine sludge is made up of oxidized motor oil, dirt, soot, water vapor, and leaked coolant. Using a good motor oil will keep all of these harmful contaminants suspended in the oil, ready to be flushed out on your next oil change. 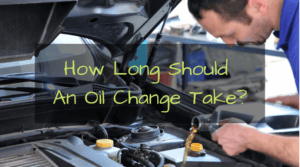 If you have a nasty habit of not changing the oil on a regular basis, then you will most likely deal with engine sludge sometime in the future. If you notice these symptoms on your car or bike, then you should definitely check the motor for the presence of engine sludge. You can also check for the presence of engine sludge by pointing a flashlight inside the engine. 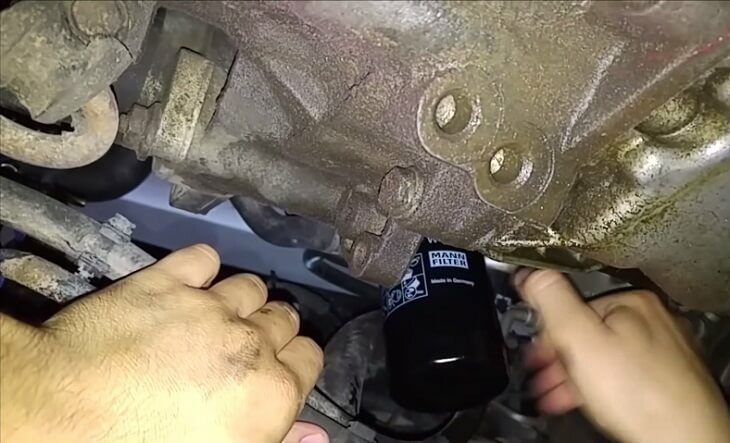 Simply remove the oil cap and use a flashlight to check for accumulated sludge inside the valve cover. If you do this, you will notice that the components are all covered in oil, but you should still see the metallic parts glistening in the light. If you see thick tarry deposits inside the valve cover, you might be dealing with a serious case of engine sludge. Of course, the best way to determine the extent of the damage is to take the motor apart. In severe cases of sludge, you might need to buy a new motor. 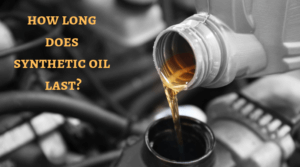 If you haven’t changed the oil in your car for more than 7,000 kilometers (or approximately 1 year) then you can expect a slight formation of engine sludge. Fear not. 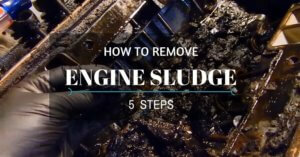 Here are the 5 easy steps on how to remove engine sludge. Park your car is a safe and level area. Open the hood and remove the engine oil cap. 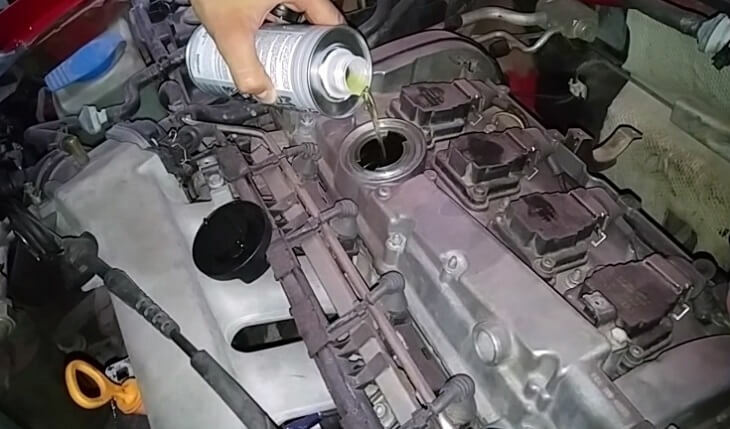 Pour a can of engine flush or oil flush treatment inside the engine. Tighten the engine oil cap and close the hood. Start the car, and let it idle for 10 to 15 minutes. DO NOT DRIVE THE CAR. Just let it idle and warm up thoroughly. The engine flush will help to liquefy the sludge, making it easier to mix with the dirty oil so you can flush it out completely. 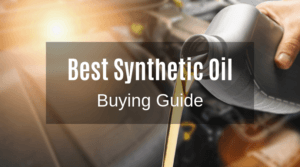 You can use a product like Sea Foam Motor Treatment or Liqui Moly Pro-Line Engine Flush, but you can use any type of engine flush from a reputable manufacturer. After the engine is all warmed up, it is time to turn off the engine and drain the oil. 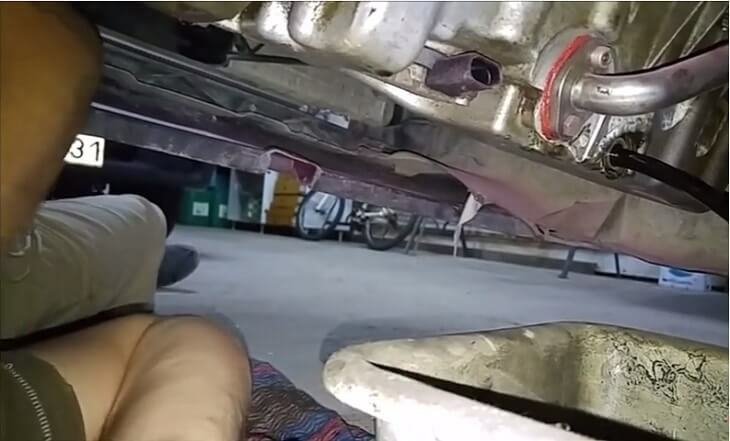 Simply remove the drain plug in the oil pan and let the dirty oil and sludge drain away. Use a clean container to catch the dirty oil. Take your time while doing this. You can also use pressurized air to thoroughly clean and flush all the dirt inside the engine. Remove the oil cap, turn on the air compressor, and insert a hose inside the oil filler. The pressurized air will help to further loosen up the dirt and sludge inside the engine so it easily drains out of the motor. 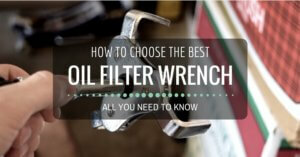 Loosen the oil filter using an oil filter wrench and allow the remaining oil to drain. Discard the dirty filter. Grab the new oil filter and put a small amount of clean oil on the oil filter gasket. Use only your hand to install the oil filter. Turn the oil filter in a clockwise direction to tighten. After draining the dirty oil and installing a new oil filter, you should go ahead and reinstall the drain plug. You don’t want the fresh motor oil to flood your garage, right? 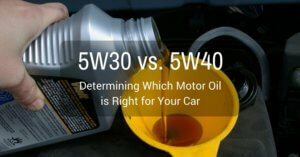 Make sure that you are using the proper grade, weight, and rating of motor oil for your vehicle. When in doubt, refer to the service manual. 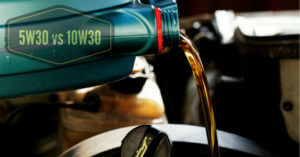 Not using the right kind of motor oil will contribute to the formation of engine sludge. Simply pour the motor oil and check the oil level via the dipstick. Do not overfill the motor with oil. The oil level should be in the middle of ADD and FULL. 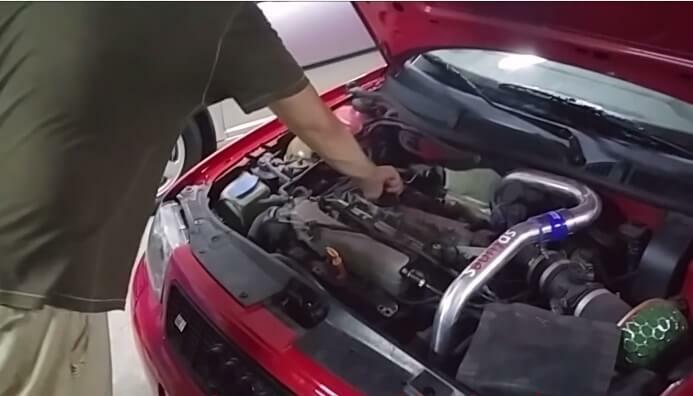 After pouring fresh motor oil and checking the oil level, screw the oil filler cap tightly, close the hood, and you’re done! Here are a couple of tips that will help prevent the build-up of engine sludge inside the motor. 1. Regular oil changes. Make sure that your vehicle is serviced accordingly. Check the owner’s manual for the recommended service intervals. 2. 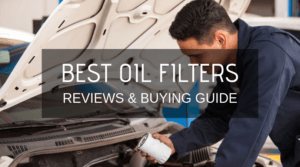 Always use good quality motor oil and oil filter when changing the oil. 3. Avoid stop-and-go driving as much as possible. 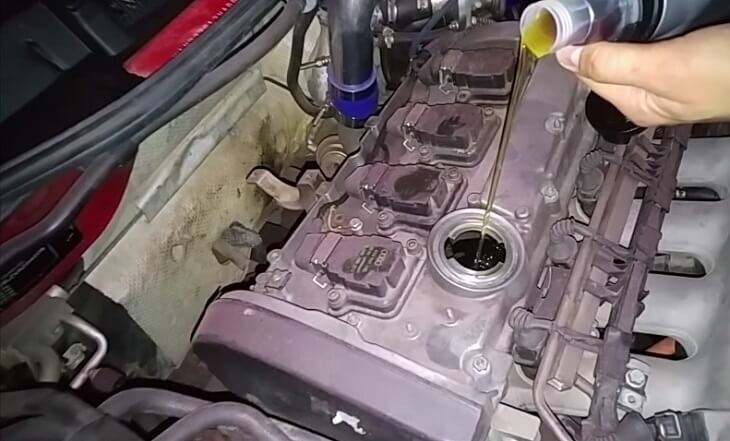 If your vehicle is subjected to extreme use, then you will need to change the oil more frequently. 4. If you have a diesel engine, it is wise to constantly maintain the integrity of your fuel system. If you detect any abnormalities such as hard starting, knocking, excess smoke, or poor performance, have your car or truck inspected by a qualified mechanic. 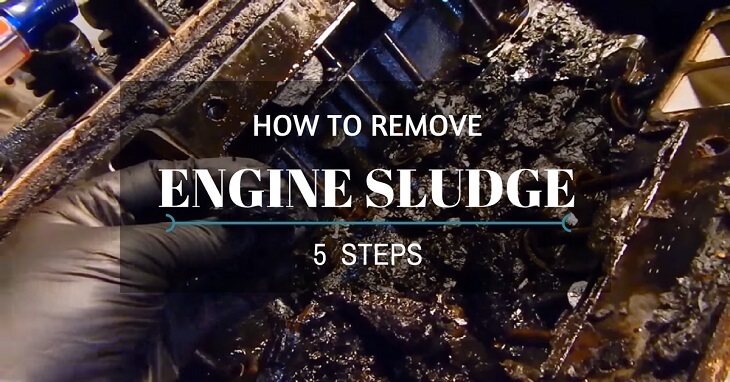 It is easy to remove the build-up of sludge inside your engine. Remember to always use a good quality motor oil whenever your vehicle is due for an oil change. It is also advisable to follow the service recommendations of your vehicle to prevent engine sludge from accumulating inside the motor. Loa aceites son de petroleo, pero de acuerdo a sus bases y al tipo de proceso estos tendrán buen comportamiento dentro del motor. En el mercado actual los aceites de base Grupo II o Grupo III+, con un proceso de hidrocraqueado, luego del destilado, se consigue un buen aceite Full Synthetic o Blend Synthetic, conjuntamente con los aditivos que le mejoran sus propiedades y que soportarán altas temperaturas y esfuerzo de corte dentro de las piezas en movimiento del motor. I have been using petrol or diesel to clean my motorcycle engine. 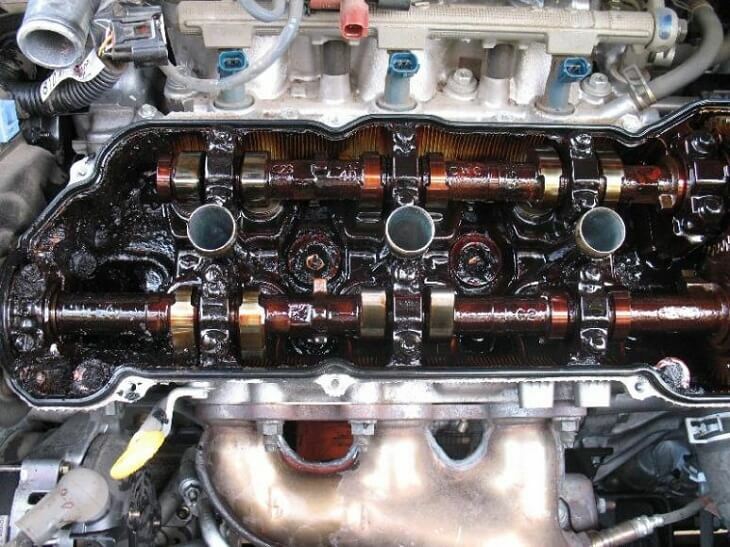 The engine gets oil stains and sludges and oil breaks them and makes it easier to clean the engine. I liked what you said about removing engine sludge. I liked what you said about how you should make sure you put the filler cap on tightly after you are done. It does seem like a good idea to get a professional to do this for me.